This website provides information, affordable pricing, and online sales of Supermarket Shelves Single Sided and Double Sided in stock. A single sided wall shelves section includes one Basic Upright with Cap, one Base Shelf, one Kickplate, one Back Panel and one Top, Center, and Lower Spanner. If the Gondola is 78" tall or taller, the section would also include one Splicer Spanner. A double sided island aisle of shelves is a versatile merchandising system for many types of product. The double sided island can be connected together to create an endless display aisle. A standard end cap is configured using a wall section with a double back and slides right up to an existing aisle of Gondola Shelving. Heavy gauge steel wire construction, powder coated for long life and extra wear constructed for Potato Chips in a Grocery Store, Supermarket, Candy, Bed Linen, and more. Wire Power Wings are typically mounted onto a Gondola End Cap for more merchandising. Typically used in the check out aisle of a supermarket for candy and impulse items. 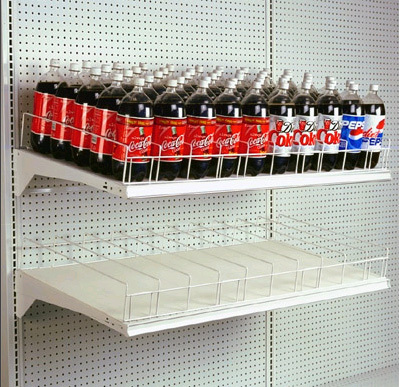 Soda Bottle Shelves configured using a Madix heavy duty shelf with a plastic shelf liner that will allow the bottles to slide and a wire fence. Chip Displays configured with wire shelves on an existing Gondola Shelving Unit. This 4-Way display is a versatile fixture that gives maximum exposure to impulse items. Panel frames are slotted to accept all Madix Standard Shelves or accessories. The Laminated or Carpeted Deck is 5" high, plus the deck has 'T' mold edge to match kickplate. Using Supermarket Shelves is a great way to display all types of items such as boxed items like soaps, paper items like toilet paper and paper towels, jarred items like jelly, peanut butter, canned goods like bulk soda, bagged items like chips, and small items that can be hung on a peg hook. Store shelving can be delivered through many warehouses located in all parts of the country. Have a look at many different colors and high end shelving systems.